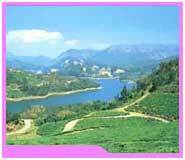 another famous hill station of the Nilgiris. Coonoor is famous for its verdant environs and for a variety of wildflowers and birds. Coonoor provides a perfect setting for activities like trekking and hiking. It is also famous for its tea plantations and festivals. 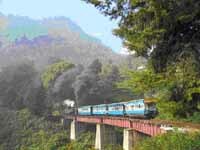 comes under the Coimbatore-Mettupalayam-Coonoor-Ooty circuit. There are several places to see and visit near Coonoor. The Dolphin's Nose Viewpoint, which is 10 kms from Coonoor, is an important place to visit. It not only provides a panoramic view of the vast expanse of the Nilgiri hills but also of the famous Catherine Falls. The south Indian city of Coonoor is easily accessible through air, road and rail from the other major Indian cities and states. Tourists can arrange for you all types of transport for comfortable journey to and in Coonoor and throughout the state of Tamil Nadu. In order to make the travel tour to Coonoor even more joyful you need to choose just the right kind of accommodation for you and your family or friends in Coonoor. The various hotels packages in Coonoor offer the best of facilities. The well-furnished rooms make excellent place to stay in Coonoor, with most of the comforts at your feet. Planning a summer vacation trip to Coonoor city or enjoying your honeymoon holidays? Check out the following all-inclusive tour packages, tours and holiday offers that will make your travel trip to Coonoor city comfortable and enjoyable. We provide a range of tour packages and holiday offers for the city of Coonoor that will suit your requirements and budget. As per the nature, duration and the accommodation required during the holiday trip or vacation travel to Coonoor city the tour packages vary.